I have posted reviews in the past on power tools that have been in service for a number of years. My reasoning was to aid buyers of used machine tools to decide when they come across such a used tool. I have posted these on the “reviews” tab, but the tool I want to now review is about 75 years old. 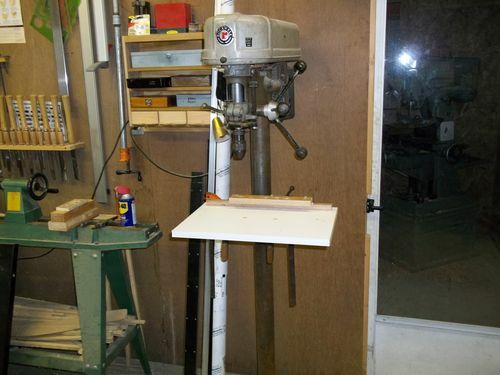 I am speaking of a Delta model 970 floor model drill press that was manufactured around the late 1930’s. I don’t know the exact date, but it had the circular base that was discontinued around 1939. This DP was very popular and remained in production for many years, using well established castings along with modern parts. Since DP’s don’t change much over the years, other than laser attachments, the basic outline of a DP remains the same. I have read the reviews of many DP’s with various comments from “satisfied” to “terrible”. A DP is a quite simple tool and shouldn’t be plagued with major problems. That being said, good used DP’s can be found at good prices. Even if you are not inclined to look for used machines, I hope you will gain some knowledge and inspiration from this. Since long term maintenance free performance is important to me, I will never buy a new machine if I can find “used iron”. I agree 100%. My oldest dates back to 1936. Most of the rest are from the 40’s through 50’s, with just a couple that are from the early 80’s. No plastic of flimsy sheet metal anywhere to be found on these beasts. PS: What did you do with the original Delta badged motor??? Sure hope you stashed it away and didn’t toss it just because of bearings! Also… are you sure of the year? The early Deltas had those ‘cone head’ belt covers, and Delta didn’t sell to Rockwell until 1945 – so that Rockwell badge would not have been used on a machine that pre-dates that… Perhaps it’s a replacement that a PO added at some time? Is there a serial number anywhere on the machine? PS: Sometimes, the motor will have a date stamp as well. I was able to salvage the bearing and used it for a lathe drawbar as a collet closer on a machinist lathe. The cover on the DP was added by me as the original was missing, but the DP is definitely pre 40’s. The rest of the motor is long gone; I don’t remember why I didn’t keep it. My other old iron is a Sheldon 11” lathe circa 1950, A delta shaper, circa 60’s, an Acme horizontal belt sander that has been rebuilt that has a Delta motor. Delta supplied Acme with the motors; it’s a 3/4 horse. My “newer” machines are a 1980’s vertical mill, a Powermatic 6” jointer, a Dewalt RAS (1970?) and a Jet cabinet saw, all in excellent condition and used almost every day in my shop. The PM jointer was the last machine I bought around 1995. I wanted to buy a 14” Delta RAS, but it was 3 phase. I do have a Ridgid 14” bandsaw that I bought new and rebuilt it. It works better than when it was new, having to re-manufacture some parts. I did a review on it in the “reviews” tab. You and I are cut out of the same cloth MrRon. I bought most of the machines in my shop from the lathe 1950s through the 1970s and they were used machines when I purchased them. All are light industrial types, Delta and Walker-Turner, etc. And all are kept in “like new” condition, cleaned and lubricated periodically, and operate beautifully, some being 75 years old (WW-2 vintage). By the way, I follow your posts and would love to know if you live anywhere close to me. I like on the north side of Atlanta, GA.
Planeman40, I’m, originally from NEW YORK CITY and being in the shipbuilding industry all my working life, have lived in seaport areas, like Boston, Portsmouth, NH, Portland, Me, Seattle, San Francisco and San Diego. I finally ended up in Ocean Springs, Ms where I retired from Ingalls Shipbuilding. I have been up through your area a few times, passing through, but would like to see more of Atlanta. If you ever get down my way, it would be great to meet with you and discuss our love of tools. If I’m ever up your way, I will be sure to contact you. My brother worked at Ingalls many years ago. Living where you are you must be an authority on rust prevention with all of that salt air! And I would love to have that 11” metal lathe you have. Mine is a 7” Austrian Maximat with a milling head attached and all of the accessories. Bought it new in 1969. Before that I had an Atlas 6” metal lathe I bought when I was seventeen from money saved working weekends and summers at a large hobby shop. Recently I finished restoring a 1953 vintage 7” Delta (Atlas) metal shaper and soon I will restore a recently acquired Delta tilt-top 10” table saw from the 1930s (http://vintagemachinery.org/photoindex/detail.aspx?id=11117). Not sure what I am going to do with it when I’m finished as I already have a 12” industrial Hammer sliding table saw. But its “old iron” and needs some preservation. I cut my teeth on building model airplanes beginning round the age of ten like most boys in those days. If you ever pass through Atlanta, PLEASE try to find the time to come by and visit. I live in the city of Sandy Springs due north of Atlanta in the Atlanta suburbs.